It was like my eyes knew what to do before my mind could comprehend the words, and the tears began to drop, one right after the other, onto my white ruffled blouse with the rhinestone buttons. I remember like yesterday looking down onto my round belly which held my (now 11-year-old) Lily as I heard my dad tell me hisdiagnosis. It’s funny how clearly the mind can remember those moments we first receive bad news. It was my first real encounter with cancer. And though it wasn’t my diagnosis, cancer became a part of my life. Uninvited. Unwanted. Inescapable. We braced ourselves for a fast and furious ride wherever it wanted to take us, with an abrupt and painful end. We knew the statistics that pancreatic cancer boasts. But, it would turn out to be a different path that my dad found himself on, with those of us close to him following always behind. And for over 11 years now, we’ve been walking down this path with my dad, watching him carry the load of cancer without really being able to help him. We’ve seen how cancer has tried to trip him up, steal his strength, and wear him down. It’s been relentless. It never lets up, and it has never left. But neither has our God. Through it all, God has never failed to give us peace when the waves of doubt and fear have crashed down. He has never left us to drown in the deep. So many of you have prayed, and we have felt it. And God has graciously extended my dad’s life way past what we thought in those first days. God has been very near to us. His strong arms have lifted us time and again. And it was His arms that held me once again when I got the call from Denise, my best friend of over 35 years. The silence told me everything I never wanted to hear, and I walked straight out of the house to be with her in those first, raw, life-changing moments when cancer becomes a part of your life. Just days before, we had sat in our house and screamed “Happy New Year!” with a roomful of us who expected it to be just that. But, “just another year” it’s not. Already, there has been surgery and recovery, bad news and good news. And today: the first round of chemo. Denise has already won the first battle with cancer through surgery, for which we thank God. But the fight isn’t quite over. And even in these first short months of 2014, God has proven Himself to be everything He promised and more. Heartache? Disbelief? More tears than you can count? Yes, we’ve had them. But we’ve also felt amazing peace when it seemed we should be in despair. And we’ve been able to laugh ’til it hurt when we thought we’d lost that chance. Have I made friends with cancer? No. It’s not welcome in my life, but that doesn’t mean I may not have to face it again sometime. And you may have to, as well. 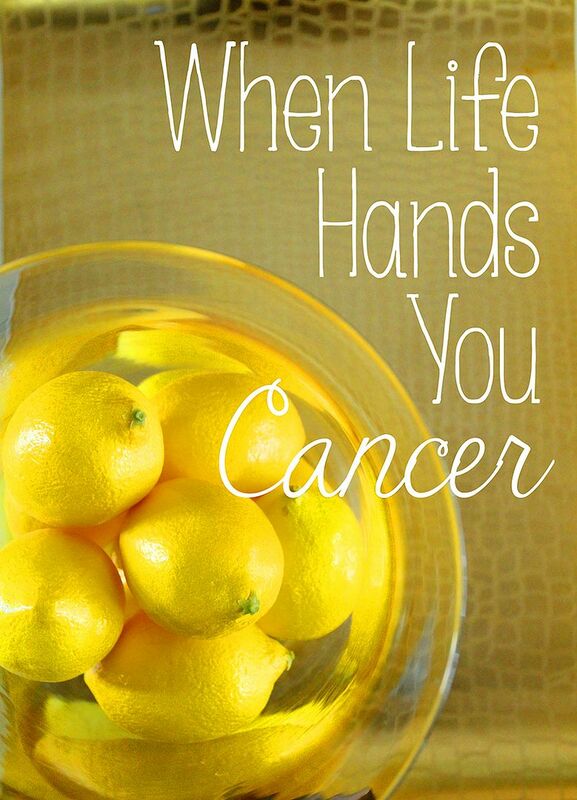 So what can you do when life hands you cancer? Cry your eyes out if you want to. Stay in bed until it sinks in if you need to. And then get up and keep living. If you’re not the one with the diagnosis, be whatever your friend or family member needs you to be. Every person is unique, and handles cancer differently. Help in the way they want help. With whatever you’re doing, ask yourself if you’re doing it to help them or if it’s really just helping you. It’s very hard to do nothing when someone close to you is diagnosed, but if they really don’t want or need the help, be willing to accept that. Let them be honest with you about what they want from you, and then don’t be hurt if it’s not what you had planned. If they need time alone, stay away. If they need you there, try as hard as you can to be there. But, above all of this, run to God. It’s exactly what He wants you to do. He wants us todepend on Him, to need Him, andto ask Him for help. And not just long enough to help us get through our suffering. He wants us to need Him and rely on Him every day of our lives. Andcancer isthe very door that leads some peoplestraight to Him. If you don’t know Him, there’s no better time than now. Don’t just ask people to pray for you, talk to Him yourself and find out what He wants you to learn through it all. And if you can’t find the words to pray in those first aching moments and days, don’t worry. He knows us better than we’ll ever know ourselves anyway. If you need to know more about how to start a relationship with God, contact me. Don’t climb the treacherous path of cancer and miss the chance to have the perspective only it can give. I don’t want to presume to know what it feels like to be diagnosed with cancer myself, and I don’t want to offend anyone by appearing that I do. But, I’ve traveled a path of my own as I’ve watched those close to me, and I’ve learned great lessons from them. I’ve seen how God gives strength in the weakest moments of life. I’ve seen His grace flow through those I meant to encourage, because they end up encouraging me. If you will pray for Denise during these next several weeks of chemo, I will be forever grateful. She has amazed us all with her attitude and sense of humor through these difficult months. She’s always been the life of the party (and I’ve shown you several of her parties here on the blog), and we will have plenty to celebrate again when this is all over. We’ve been friends together in sunshine and in shade, we’ve endured bad hair days,and we’ll endure the no-hair days. And we will look forward to brighter days ahead. If you have traveled this journey and would like to leave a message of encouragement for her, she will see it here. And if you have other helpful advice forthose facing cancer, or if you’d like to share your story, we’dlove to hear it. Please share yourcomments below. This entry was posted in Uncategorized and tagged Cancer, Faith, Family, Friends, Life. Bookmark the permalink. Follow any comments here with the RSS feed for this post. Post a comment or leave a trackback: Trackback URL. Julie, your words all rang very true with me too. My Dad was diagnosed with leukemia last June. Thankfully he has gone through 6 rounds of chemo and is well for now. We know it might come back sooner or later because the doctor told us it usually does. Instead of focusing on the scary part, my Dad is forging ahead. At 75 he is amazing! Denise, I'm sending up prayers for you. 🙂 You obviously have a wonderful support system and it means the world. I'm writing this from the point of view of the daughter but these are a couple of things I saw in the process with my Dad…. Bond with the other people at the infusion suite. They helped each other more than I could have ever imagined. They shared their journeys, what was working for them, and what to avoid. They laughed together and cried together and even though cancer was the common denominator it made everybody feel like they were in it together and not alone. Don't be afraid to stop answering the phone or even ask people not to call so much. That's sounds crazy but my Dad actually got grumpy at one point because he couldn't even rest with the phone ringing off the wall. It was always a friend or family member wanting to help but rest is very necessary. Thanks so much for the helpful advice, Stacey! Praying for you both! So much I could say, but God is always faithful! Yes, He is, Lanissa! Your prayers mean so much. Beautiful post. I lost my mother to cancer 4-1/2 years ago. I remember exactly where I was when I got the call that she was diagnosed with ovarian cancer. I too had never known anyone with cancer. It rocks your world. But in the year prior to her passing, I never felt closer to God. Praying for you, your Dad and your sweet friend. Wow! I am all blubbering and crying right now! You 2 remind me so much of myself and my dearest bestie, Jacquie Neher. You are a beautiful picture of a loving, sacrificial and graceful friend – what a gift! Thanks for calling a shout out of prayer for "your" Denise, and for allowing us here to give her a word of encouragement in this moment of hers. Denise: May you know that there is a girl way over here in the Dominican Republic who will begin lifting you in our morning prayer time. I will bring it before my family. My heart goes out to you and your family during this time. May your God, Denise, convince you thru His Holy Name and the Spirit of the Living God who lives within you, that He truly is your Everlasting God, from the ends of the earth, He does not faint, nor is He weary, to those of us who are weak, He gives strength. May He help you to wait upon Him, and thru that, your strength be renewed. Lord, refresh her soul today, and may your precious name "LORD" truly be a strong tower of safety and refuge for her today…. This is beautiful, Kelly! Your prayers are so appreciated. Julie, I am forever amazed at the things I find on your blog and am so glad I found it. Your post made me laugh, cry and wonder at the courage, strength and wisdom found within those words. I praise God for your father and his refusal to give up or give in to cancer. May he continue to be blessed, each and every day and may his life be a shining example of God's love to those whose path he crosses. Denise, while I may not know you, HE KNOWS YOU. Do not give up. Do not fear, for the Lord our God is with you and he knows your heart and mind, needs and wants more thoroughly than you can ever express. Cancer is horrible, and can easily become a disease of the spirit as well as of the body. I pray you have the strength and the courage to fight both. In reading Julie's words about you, my heart started singing and I want to share it with you—may it be an inspiration for when you don't have the words yourself, and may it be the anthem you shout when you're able and willing— "One Thing Remains" by Jesus Culture and found here–> https://www.youtube.com/watch?v=6_KXsMCJgBQ He will not fail you. He will not give up on you. His love NEVER FAILS. The Lord bless you and keep you all, and know that here in Chesapeake, VA your sister in Christ and cheerleader is rooting for you to kick cancer where it counts! So encouraging, Beth! Such a great song and so, so true. Thanks for your prayers! Isn't that beautiful? And spot on? I hope it can bring a measure of strength to you both as you recognize this trial for what it is and also what can be gained from going through it. Have a nice day, ladies! Such an amazing story you have, Rachelle. Thanks for sharing it. And thanks for sharing this poem. Truly beautiful. Ill be praying for your beautiful friend!!! Your comments about how to help your friend Denise in the way SHE needs really spoke to me. I recently was on strict bed rest for 12 weeks and completely dependent on others. While I know my family and friends meant well, sometimes the help was more of a burden and not at all what I needed. Thank you so much for having the mind and heart to help Denise as she needs it and wants it. What a gift to have a friend you can say no to and not worry about hurting their feelings while in the depths of your own struggles. That in itself helps more than you know. Denise, I will be praying for endurance and peace as you face many appointments and interruptions and invasions into your life. Praying for the Lord to be ever apparent in those dark times in ways that it is obvious He has you wrapped in His loving arms. So helpful, Christine! Thank you! So sorry to hear this news about Denise. Will be praying for her and you as you help her through the days and weeks ahead. That means so much, Michelle! Ahhhhh…this came at the perfect time for me. My mom was just diagnosed with Breast Cancer – scheduled for surgery one week from today, and will most likely have Chemo as well. What an encouragement to me! I will be praying for Denise! Thank you Julie….your best blog to date! Oh, Jacquie! So sorry to hear about your mom. Praying for you all as well. May God's perfect peace be with you every step of the way. So sorry to hear but thank you for such a powerful message on the blog today. God has always been a part of my life, but my cancer really made me turn to him. I felt guilty that I turned so to him at that time, but you've helped me see that is what He wanted. Prayers going up. Thank you, Deb. I'm glad you feel that way & appreciate your prayers! This post came to me at a time when I need it also. My husband was diagnosed with prostate cancer last month. He will have surgery in April. He is not 60 yet and in good health otherwise so we know that will give him better odds. We are hoping and praying we will not have to go the radiation route, but time will tell. Thank you so much for your words of wisdom and experience. I will think of them when I am supporting my husband. Denise I will be praying for you. Sending you hugs and God Bless. You two girls are blessed to have one another. Lin, so sorry to hear about your husband. I'm going to use this comment section as a prayer list as I pray for Denise. Thanks for your prayers, too! Denise, my heart goes out to you. I have been fighting Breast Cancer for 14 years now, and I'm still fighting! I have learned to take 1 day at a time, and to rest a lot when I am tired. I pray a lot and try to laugh a lot,and just do things that make me happy. I try not to imagine the worst,so I just live my life as though I will live forever, cherishing my family, the beauty of the small things in life, and of course, with prayer. Godspeed, Denise, and know there will be many people praying for you! Thanks so much for your encouragement. God bless you in your own fight! Thanks for your prayers, Lori! Julie, I am so sorry to hear that about Denise. I will add her to my morning prayer list. You are a good friend. I am glad she has you to be there for her when she needs to cry. I know God will work all things for the good of those who love Him and from what I have read about Denise and what I know about your father, they both love God dearly and He will redeem their battle with cancer. As you know, my dad died from a very short battle of cancer (10 days), the 23rd anniversary of which is Friday. What a very moving and wonderful blog entry, Julie. You are a wonderful inspiration in many ways. I will continue to pray for your dad and Denise. Lynette, I remember when your dad died 🙁 Thanks for being a friend and encourager to me since those first days of 6th grade! And thanks for your prayers!